The use of certain elements we consider “Sound Effects” in Music is much more common than we may think. Whether it’s nature ambiances heard lightly in the background of a New Age track or the aurally unpleasant bang of a trashcan lid in Industrial music, our perception of what purely differentiates the line between Sound Effects and Music is rapidly blurring. I recently became more aware of this progression earlier this year when tasked to compose an eerie / ethereal background track for a horror game. The piece most definitely had to set a mood and have direction, but never really intrude the player’s “consciousness” enough to have them recognize or become aware of “Oh hey there is music being played now.” So, in a way the music was to act in a role we may consider to be more common with sound design. Now this practice in and of itself is not new, but the questions I asked myself while approaching this problem and the previously closed “doors” the answers opened up to me are new and unique enough to want to share my findings with you. Asking and answering all of these questions were absolutely critical for taking an accurate first step towards fully expressing my intent with the piece. That is why I often take this step and recommend many others do as well (especially if you need to be very articulate with what you’re wanting to express). Let’s go through the process of asking and answering a few questions unique to a piece of music like this. Since there is no right or wrong answer to this question, I only felt compelled to organize/understand my instrumentation choices enough to justify their usage in the piece. So, I decided that my approach to this piece had to be one focused more on timbre/moods and that writing standard musical phrases easily identifiable as “music” by the human ear were off limits. At least initially, as I also decided that “sneaking in” the main theme from time to time would be okay (as long as it’s full introduction was gradual). However, for the most part, I “justified” the usage of some traditional musical instruments by challenging myself to use them in a unique way that wouldn’t immediately be perceived as a musical phrase by the listener. 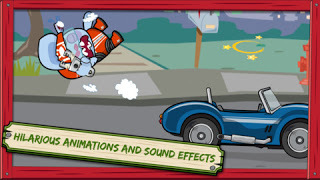 “Typical” sound design elements (impacts/crashes/scrapes/etc.) were also allowed, but must be organized in such a manner that they would have a perceived direction. As I mentioned before, the line between what could only be considered Sound Effects and what could only be Music, is rapidly blurring. Impacts, soundscapes, and other “sound design elements” are being used so often in modern music that I believe the only clear distinction between the two is the way each one is structured. This is not to say that Sound Effects can’t be organized in a way to tell a story, for they surely can, but rather the way in which we approach and organize our sounds for music is different. Repetition and imitation are two of the most common techniques used in music from almost anywhere in the world at anytime in history. When you’re lacking tonality, melody, and other “common” western musical constructs, more often than not we revert to repetition and imitation to structure our music (both for our sake and the listener’s ears). Often times, when your creating Sound Effects to picture, its not ideal to only use one punch/kick sound for an entire fight scene. However, I can also imagine the argument that the variety in those punch/kick sound effects, are the equivalent of musical imitation. So, perhaps the only real thing separating the difference between Sound Design and Music is our perception/preconceived notions of what each one “should” be. With that said, I decided that the role of Form in this piece was to take these isolated sound ideas/motifs and repeat/imitate them in a manner that felt like it was going somewhere (The repetition/imitation itself not having to be structured, but perhaps more organic or improvised). Complex and strict forms like Sonata or even Pop wouldn’t accurately achieve this goal. So, it was determined that the form must be even more basic (remember we don’t want the listener to immediately recognize this as music). My solution was to introduce and eventually repeat/imitate these “themes/motifs” as they were applied throughout the changes in the dynamic curve. I feel very strongly about the role of Mixing in the Composition process, as it’s unavoidable in modern times. However, I’ll save the majority of what I have to say about this topic for a separate article. it consistent throughout the piece? from the original answers you come up with. Now that we have some unique answers to work with, it’s all about performing and capturing their essence. For instrumentation it was decided that everything is permitted, but most “standard” writing practices would not apply. Bend a string of the guitar beyond its “comfortable point” and play your theme. Play the Piano with socks on your hands or breathe into the mic and apply massive reverse delay. Place a huge pillowcase over your mic/head and start to sing. Record your harp in the bathtub or pitch up/down kitchen pan impacts and organize them to build a triad. The options available to you are only restrained by your ability to ignore the fear of “What will others think?” The Answer to “What is Music?” is growing every day with new ideas from creative composers willing to push the boundaries of sound and a more accepting audience that’s aching for something new/original. With that said, I’d like to wish all of you the best and keep composing fellow artists! If you’d like to listen to piece of music I finished, click here and tell me where to send it. These articles are not intended to be a master source for everything one must consider (and how to prioritize them) when scoring a game, rather it will be a series of articles based off my experiences with each newly completed project. As I learn from the process, the other developers that are involved, and write about the experiences here, I hope the information will help better guide your future scoring efforts for games. I recently had the pleasure of composing the original soundtrack to a fantastic 2d pirate Simulation/RPG called, Pixel Piracy. The experience itself was fantastic and I couldn’t have asked for a better developer to collaborate with, so there weren’t really any unexpected issues we ran into later in the process. However, as there is with every project, there were a few unique musical situations that I had to consider. The first thing I had to consider was the role music would play in Pixel Piracy. The developer and I had a few discussions beforehand, but they were very open to my suggestions, which let me be more confident in my decisions. This is something that can’t be understated, as it directly affected the quality of the music. It was through this very open line of communication that we decided on two main roles for the music to play. The first was to “set the stage” so to speak & operate as any normal background score in a game. Subtly enhancing the action on screen while subconsciously influencing the player’s mood. The second role was for some of the music to be consciously thought of as music & possibly participated in by the listener. 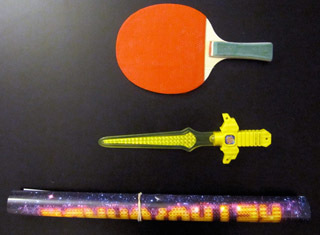 Each main Role was split into multiple sub-roles that ultimately defined Pixel Piracy’s “Musical Identity”. For the subconscious background score role, we split it into two distinct categories: Combat & Neutral. The Combat sub-role covered all potential combat situations in the game, both in the water and on land. 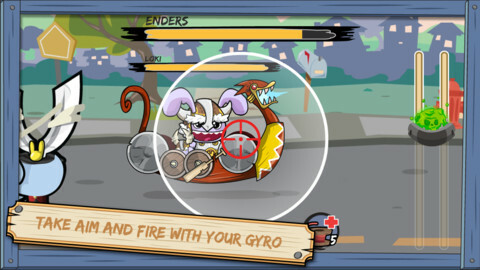 Here’s a Combat Example. The Neutral sub-role’s purpose was to serve as light background music during relatively placid moments in the game. Here’s a Neutral Example. 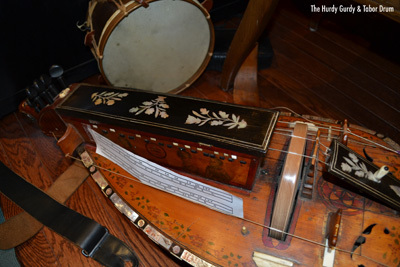 For the Conscious Musical Role, we also split it into two separate categories: Tavern Tunes & Sea Shanties. Both sub-roles could be instrumental only, but the thing that makes them unique, and thus consciously thought of by players more often, is the Lyrics/Vocals featured in many of the pieces. The Tavern Tunes sub-role only plays when the player is on an island with a Tavern & his captain is inside of it. Here’s a Tavern Tune Example. The Sea Shanties sub-role only triggers when the player is sailing across the sea on his/her ship. Here’s a Sea Shanty Example. I needed to find the very essence of what it’s like to sail the rowdy pixilated seas with your merry band of salty dogs. To accomplish this, I frequently played early builds of the game and had some in depth discussions with the developer, which helped inform me of the overall tone of the game. Beyond that I looked for inspiration in various styles of music and other pirate related media. Pixel Piracy is a fun and adventurous game, so Irish Jigs and Reels immediately popped into my mind as a base for the game’s music. I love its jaunty disposition and the unique instrumental colors that comprise its traditional ensemble. However, it wasn’t appropriate for some game play situations to stick strictly within the parameters of this style’s guidelines. It was in these situations, like walking along the beach of a new island or raiding a rival’s pirate ship that I snuck in other influences. 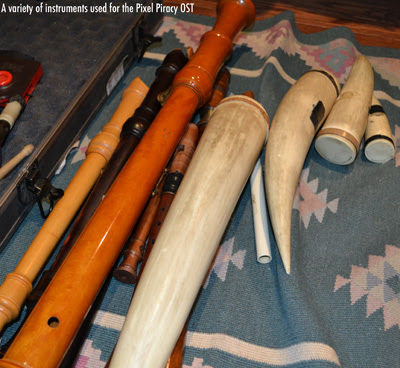 Specifically, unique world wind instruments (like a Gemshorn), period instruments (like a Hurdy Gurdy), and of course the bombastic Symphonic flavors used in other popular Pirate projects. Over the years I’ve invested quite a bit in my own personal rig so that I’d have access to the best virtual instruments and sample libraries on the market. However, no matter how much time I spent behind the computer programming, certain instruments just wouldn’t sound as raw or beautiful as I wanted. So I had the pleasure of hiring a handful of fantastic session musicians (Cello, Violin, Accordion, & a unique instrument specialist) that brought the music to life. Their input, knowledge of their instruments, and interpretation of what I wrote was immensely valuable and Pixel Piracy is the benefactor. In fact, I don’t think I (or anyone else) could have pulled off this score with the same amount of energy and authenticity if live musicians weren’t hired. At this point you might be asking, “But the graphical style is very pixilated. This seems like a big part of the game and would justify the use of 8-bit/Chiptune music; so why did you ignore it?” The answer is, we didn’t ignore it. We actively had a discussion about its usage in the game and came to the conclusion that an 8-bit style score would push the “nostalgia factor” too much and wouldn’t allow for the raw/gritty emotion derived from acoustic instruments to filter through to the gamer. For some games Chip tunes work perfectly, but for us we felt like it was an unnecessary stereotype for the music to follow and would ultimately limit the score’s effectiveness. 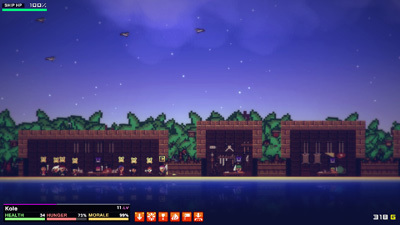 Some games necessitate the design of a highly interactive and complex music system; Pixel Piracy is not one of those games. That’s not to say a simple music system is less effective than a complex one, but rather that each game requires its own unique music solution. 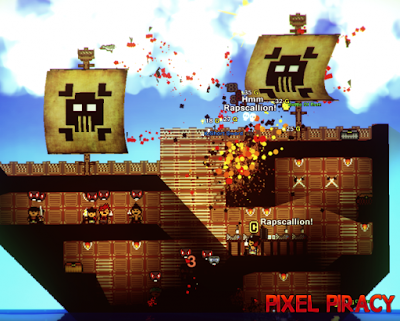 For Pixel Piracy, we felt comfortable in its system’s simplicity and rather than worrying about creating various stems or mixes of each piece and hoping it would implement correctly, I could just focus on writing a good, solid piece of music. Even though our music system was relatively simple in that it only looped full tunes & faded in/out when necessary, we added some depth to it without magnifying our workload. For example, the jaunty tunes inspired by Irish Jigs/Reels will only play when your Captain is on an island with a Tavern. Also, when in combat, rather than loop the same song over and over again the system will cycle through a handful of appropriate combat songs after one of them has ended. It’s not perfectly seamless, but I composed the combat tracks in a way (Similar tempo & exact same key) so that transitioning from one piece to another is relatively smooth. Although Game Music is very important to setting the tone of a game & carrying or transitioning a player through various areas/game states, it is still near the bottom of a programmer’s priority list. This is not because they don’t think your work is important, but rather (if you’re not implementing it yourself) they have so many other tasks to focus on that they rarely have time to dedicate solely to music. Programmer time is a rare resource, so use it wisely; we were very fortunate that our music system could be quite simple and still have everything sound top notch. In addition to the rarity of the Programmer’s time, I had a pretty short amount of time to write, record, and mix/master the entire score. So it was essential that I scheduled out my weeks in a manner that would allow me to work efficiently. As Composers know, being inspired & writing great music isn’t simply a switch you turn off/on, so when it was difficult for me to write I would focus on other tasks like finishing charts for musicians or uploading the Pro Tools session to my server so the Recording Engineer could pull it down. 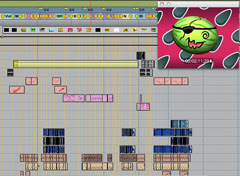 Mixing up my tasks & staying busy kept the momentum up; allowing me to finish the score right on time without any “crunch” whatsoever. As mentioned in the italics at the beginning of this article, this is by no means a complete list and I’m still a young professional with many ups/downs ahead in my career, but nevertheless I believe this information can be beneficial to many composers no matter their experience level. Thanks for reading and keep composing fellow artists! * These articles are not intended to be a master source for everything one must consider (and how to prioritize them) when scoring a game, rather it will be a series of articles based off my experiences with each newly completed project. As I learn from the process, the other developers that are involved, and write about the experiences here, I hope the information will help better guide your future scoring efforts for games. In this article I would like to discuss a few of the things I had to consider when scoring the latest release from Ender’s Fund, “Rabid Rascals“. 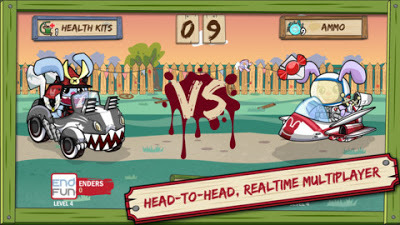 This is a head-to-head mobile game with a unique hyper-violent “stuffed animal” type art style where you can take out opponents and level up to get better gear. 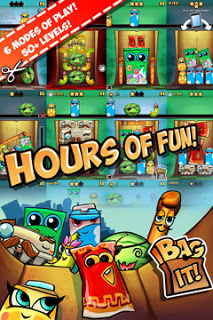 It’s free to play, so I’d recommend checking it out HERE! For example, if we understand that most battles in-game will be around 60 seconds long, then a 15 second combat cue on a loop could get absolutely irritating. It may even get to the point where a player would turn the sound off entirely. My rule of thumb (for mobile games) is to figure out the average amount of time a player spends on a certain screen (or in a specific game mode/state) and then create a cue around 1 ½ times that length. This covers the “standard” situation, but also lasts a little bit longer before looping for those epic battles. However, sometimes this may not be a possible option, as some games will keep a player in the same game mode/state for 5 minutes or more. For “Rabid Rascals” though, and many of the other mobile titles I’ve worked on, my rule of thumb seemed to work quite well. In addition to the average amount of time a player spends in each game mode/state, I recommend figuring out how that game mode/state evolves over the player’s experience with it. In “Rabid Rascals,” we knew that battles would get more intense over time as each player landed shots and their character’s health receded. So, for “semi-timed” game modes/states like this, I was able to build the intensity of the piece over its entirety to help enhance what is happening visually. Although this is a simple loop and not in any way interactive, it can help give the illusion of an adaptive score; which ultimately adds a bit more tension to each battle. Last but not least, don’t be afraid to write less music than you originally intended. For example, we could have easily decided that the inventory management/shop screens should have their own specific music cue. However, because the player may switch between the main menu and inventory screens often, we felt it was better to just have the Lobby/Main Menu piece play throughout both screens as to not break the momentum of the piece. Otherwise it could get tremendously annoying to consistently hear the first 5 — 10 seconds of both the Lobby and Inventory/Shop cues as you switch between the screens. **It’s also worth mentioning the importance of clearly defining the feel of each game mode/state/screen with your music in mobile games. You often have less music to work with and can’t always develop/evolve motifs over multiple pieces. Get to the point, but be clever with your usage of these themes. For “Rabid Rascals” we only used 3 pieces of music. Lobby (=Mischievous/Fun), Versus Screen (=Impending Danger), Battle (=Chaotic blend of the previous 2 feels). Some game engines, especially if they allow FMOD or Wwise integration, can contain highly interactive music scores. However in my experience, for the most part, mobile games either don’t call for this amount of interactivity or don’t have the financial resources available to license a 3rd party audio software like FMOD or Wwise. So, it is up to us to do the best with what we have available… which in most situations tends to solely be loops. Mp3s tend to be the most common playback format for mobile music tracks and if they are to loop, then this can cause some issues. Most notably from the tiny “bubble” of silence that is inserted before each loop repetition, thus making seamless loops nearly impossible. There are a few technical things you can do to eliminate this unwanted space, but I’d like to talk about something you can do compositionally which can help the situation. For “Rabid Rascals,” all of the tracks in the game feature a mostly percussive “outro” section. The natural decay of percussive sounds can work quite well for loops, especially if you write a piece so that the final hit allows a few beats for the sound to fade out before we loop back to beat 1. In addition to this, when applicable and expecting the piece to loop a few times, it is sometimes wise to not resolve the harmonic tension until the loop starts over again; so feel free to sit on the dominant at the end of a piece. What do I mean by “Pop?” Well, it’s purposely vague, as it could truly mean anything. For “Rabid Rascals,” we determined the music style early on and I was able to identify a few characteristics of the style that absolutely needed to be executed correctly for it to be convincing. The main thing I needed to achieve was to make sure this highly active and “bouncy” orchestral style was articulated with an immense amount of passion for it to feel alive. However, when you’re working on mobile games you rarely (if ever) get to work with a live Orchestra, especially if you only need to record a few minutes of music. Although samples are getting better every year, I still prefer using live players whenever possible. So, since it was within budget, I hired a fantastic violinist to record herself playing all of the 1st violin lines a few times. Stacking and layering in these recordings made a huge difference. Not necessarily because you could “hear” the violin more, but because the aggression captured from the live recordings “trickled” into all the other parts and made them feel more real. For your project though, the thing that makes your music “Pop” may not be a soloist at all. It might be a creative way of mixing your piece, altering your recording methods, or something else entirely. Whatever it may be, I advise you to actively search for and definite it. This will help keep your score cohesive and allow it the ability to better fulfill its role in the game. Hello Again! It’s been a little while since I’ve written one of these articles, but I just finished scoring a new game and learned quite a bit from the experience that many fellow Game Composers may find useful. 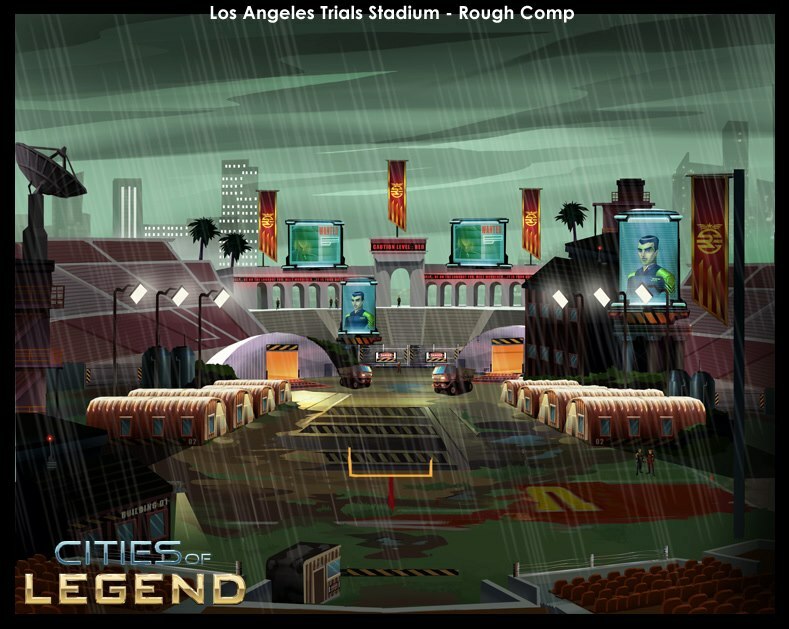 The game is called “Cities of Legend” and it’s a Social Game for Facebook based off the New York Times bestseller, “Legend” by Author Marie Lu (Developed by Wicked Sweet Games & Published by CBS Films). 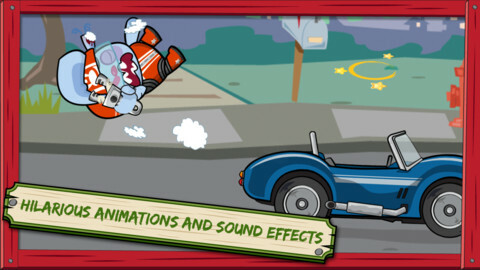 I’ve worked on Flash games for Facebook before, but have never had the opportunity of creating the “Audio World” for an established IP. That in and of itself was quite a fun challenge, but I also learned a few other things I’d like to share on what a Composer should keep in mind when scoring for games. This is the third article in this series and the first subject of each one has been about Platform Constraints. It is so tightly knit to video games and the direct performance of your music system, that I’m fully expecting to learn something new on each project (especially considering there are so many platforms to create games for!). 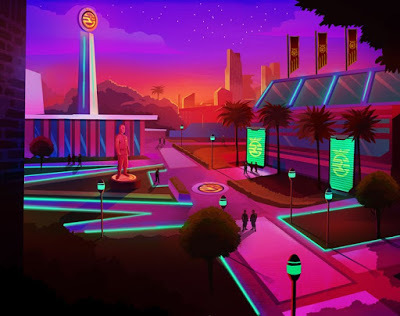 “Cities of Legend” is a flash game for Facebook, so I’d like to talk a little bit about some of the constraints we had to work around. First and foremost, people expect the loading times for their Facebook games to be minimal. The longer it takes your game to load, the higher the probability of the player just closing the window and ignoring your game altogether. This expectation directly limits the amount of music (and quality at which it’s being played back at) you can have in your game. For “Cities of Legend” we decided on three Sixty (60) second loops for: The Rebels Home, The Republic Home, and Combat/Mini-Game. Another factor that limited us to three music tracks was Flash’s inability to create a basic interactive music system. 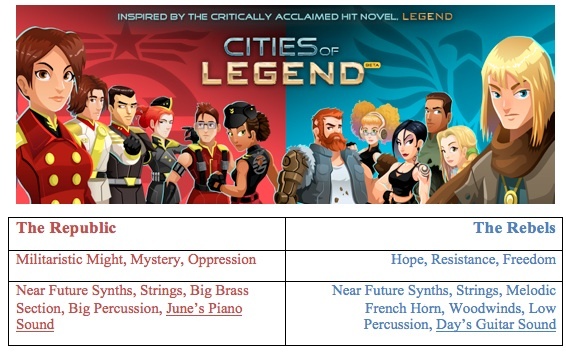 Rather than spending our time trying to force the engine into something it’s not familiar with, we decided to invest our time into reinforcing the most important moments in the game with strong, thematic music that can easily loop. Not all games feature a twenty-hour single player campaign that develops your hero from rags to riches. So the “Symphonic Composer” mindset of taking your time to cleverly develop your motifs in unique ways over longer periods of time may be completely ineffective (depending on the style, game play, demographic, etc.). While “Legend” (the Novel) is rich with detail and must take its time to dramatically crescendo, “Cities of Legend” (the Social Game) is meant to hastily throw the player in the world and have them immediately grasp almost everything that’s going on. Even if the player is unfamiliar with the world, within the first minute of playing they should understand the following: Pick a side to fight for, understand the function of the UI, and realize how to jump into battle. So as the Composer, we initially have about a minute to help reinforce or describe the tone of the faction they chose to fight for. After that amount of time, the player will most likely jump into a battle. So we have a minute, what can we say in that amount of time? Early on we decided that each faction (Republic vs Rebels) should have their own designated theme, instrumentation, and overall tone. I had read “Legend” before working on the score, but meeting with the Producer and Author was very helpful. For the sake of organization, I’ll provide a visual breakdown of how I determined which various musical elements I assigned to each faction. I mentioned in the previous section that developing your motifs over the course of a game may not be the best option (or even possible) in some scenarios. However, if you’re able to negotiate and work on the Trailers/Promo Videos (and have time to Compose the necessary themes before the trailers are released) this is a good place to do it. Rather than just writing stereotypical trailer music that would just serve to move the action along, I was able to sneak in bits and pieces of each theme (Rebel & Republic) in our various Trailers. Furthermore, I was able to “stamp” the ending logo with the Rebel motif, which just so happened to align with the overall tone of the first novel (and thus served well as a “Main motif”). I found that this was not only musically satisfying, but helped establish the world of “Legend.” This is especially effective since you won’t hear those themes (or probably that same combination of sounds/instruments together) anywhere else. 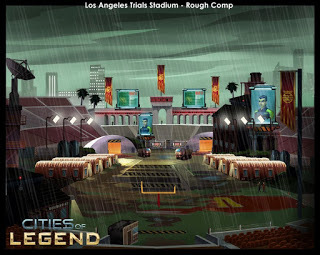 I thoroughly enjoyed my time working on the “Cities of Legend” and would highly recommend both the game and novel to anyone interested in near future dystopias with strong characters. Thanks for reading fellow Game Composers and I hope you’ve found this useful! This has always been an issue for Game Audio people, but as technology has developed over time it’s become less of a burden for those working on Console/PC games. However, with the emergence of mobile games (and restrictions of certain ‘stores’), this issue has once again reared its ugly head… or perhaps I should be the optimist & say this ‘unique challenge’ has once again reared it’s ‘special’ head. Interestingly enough, the previous mobile game I worked on (mentioned in the first article) didn’t mind if we went over the allotted 20mb limit for 3G downloading. However, the developers at Hidden Variable Studios made it absolutely clear that they wanted to keep the whole game under 20mb. After looking at the proposed asset list & discussing the audio ‘budget’ (around 3mb for all of the Audio) it became clear that this was a case of quantity or quality. I always tend to favor quality and as the game progressed it just so happened to work out that many of the proposed audio assets were not needed. 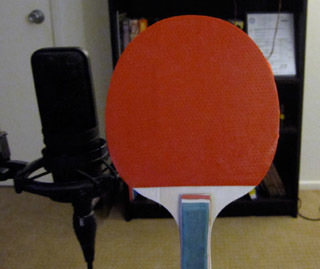 This gave us room to use a little bit higher quality audio files. In addition, working with people who had a clear vision of what they wanted really helped me develop the appropriate audio necessary in a timely manner. 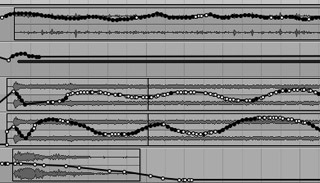 Specifically the SFX were bounced at 16/22 (mono .wav) & the Music at 16/44.1 (stereo .wav), but then compressed in Unity. Not absolutely ideal, but still pretty good and ultimately effective for the game. Also, there are issues when looping with Mp3s so fortunately (with a little tweaking from the Programmer) we were able to use features in Unity to create seamlessly looping music with .wav files. This is always a tricky one for anyone working in audio for media, as the sound/music really sells the visual. There are a million different directions to go in and you have to be aware of how other people perceive sound (more detail on this in III). With that said, the artwork for ‘Bag It’ was fantastic and really helped me when developing the appropriate mood with the music. Fortunately, the CCO I worked with directly already had a good idea of the feel of the music they wanted (even some instrumentation too!). So building the rough foundation was rather easy… especially when considering one of the reasons they decided to work with me was because of the spec demo I submitted. So identifying the elements we wanted from my piece and other music (in a similar style) was quite painless. 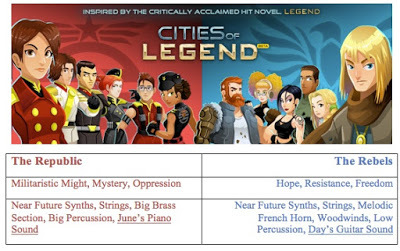 After collecting all of the appropriate instrument colors for our foundation (Pizzicato Strings, Acoustic Guitar, Piano Synth, French Horn, & Light Percussion) it was time to discuss the role our music was to fill in this game. 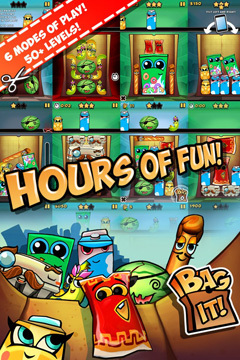 ‘Bag It!’ is a challenging, but light-hearted game driven by unique characters. We knew that the SFX would help identify the characters & realized quickly that the music should play a supporting role during game play. However, during the menu we needed the music to be a bit more active & engaging… thus there was more liberal usage of melody. Furthermore, although we backed off on our usage of melody during the game play music, we decided that it should be semi-interactive. Realizing the constraints of our platform & the feel of the game, we decided on a simple approach that allowed the music to develop ‘organically.’ Essentially it is one single piece of music (30s long), however we don’t hear the ‘big picture’ until the 2nd layer comes in. So, about 30s into playing (by then the pace has picked up a bit) you’ll hear a more active & engaging piece of music. However, I would also like to note that our original intent was to include 3 different layers in our game play music system. Unfortunately, this would put us over the 20mb limit, so we restricted it to 2. Perhaps this will change as more downloadable content is made available. I recommend buying the game to hear the ‘music system’ in action (beyond my normal bias & the fact that it’s quite fun); however I’ll also supply a link below to our trailer, which happens to feature a decent chunk of the music used in the game. Iterations are a part of life and business in every corner of the world. Trying new things, developing new ideas… it’s how we grow. With that said, I highly recommend having multiple iterations be a part of your initial bid/contract as they’re inevitable and you’ll thank yourself later. Previously I mentioned the importance of being aware of how other people perceive sound. This is especially important when working with producers who are extremely involved in the process and enjoy experimenting. On this project I was fortunate to work with a CCO who not only had a good idea of what he wanted, but knew how to speak music (or at least express the ideas he couldn’t explain with musical terms). However, there were a few cases of miscommunication based purely off our different perceptions of music. In one such case we were having an issue identifying elements of our main theme that sounded a little to ‘childish’ for the feel we were going for. Since I was creating the tracks based almost purely off our references it was hard for me to identify what our testers considered ‘childish,’ as that critique had not come up before when reviewing any of those reference tracks. Eventually, after a little discussion back and forth, we found the culprit in a Pizz. String Harmony and octave doubling with Glockenspiel on the second pass through the theme. It seems so obvious to me now that I look back at it, but why was it difficult at the time? Well, the reference tracks included Glock/Pizz. String Harmonies, but not that high in their register & not so exposed. The solution we found was to continue playing the main theme in its original range on the Piano Synth, but with Arco String accompaniment, a Guitar doubling underneath, and no Glockenspiel up top on the 2nd pass through. This helped move the piece forward while achieving our goal of keeping the piece light-hearted and playful, but mature. As mentioned in the italics at the beginning of this article, this is by no means a complete list and I’m still a young professional with many ups/downs ahead in my career, but nevertheless I believe this information can be beneficial to many composers no matter their experience level. Thanks for reading and keep composing fellow artists.